“The Earth Constitution was created through the efforts of many world citizens and international lawyers over the period of 33 years from 1958 to 1991 under the leadership of the World Constitution and Parliament Association (WCPA). During the first ten years, three Preparatory Congresses were organized and the call for a constitutional convention was circulated worldwide. It was also sent to all the national governments and UN Ambassadors. The culmination of this process was the first World Constitutional Convention in 1968 at Interlaken, Switzerland and Wolfach, Germany that attracted 200 delegates from twenty-seven countries worldwide. 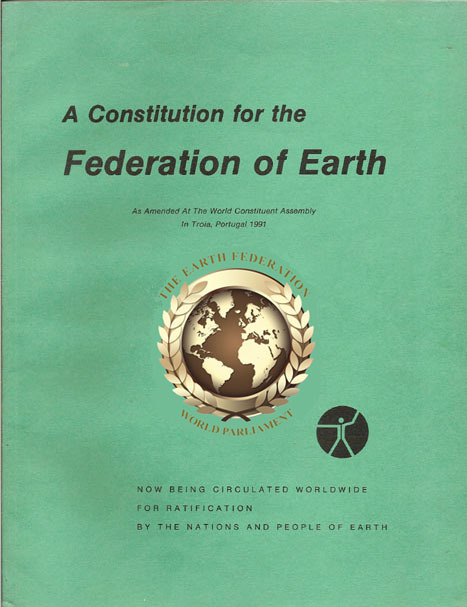 Download your copy of The Constitution for the Federation of Earth (pdf).